Cannabis is typically consumed via smoking or vaporization. In fact, one of the largest challenges for those in the medical profession who embrace cannabis as a medicine and a wellness agent is convincing patients that they should ditch joints and pipes for vaporizers. What if, however, a patient has a respiratory ailment or other condition that prevents inhaling smoke or even vapor? Possibly they simply prefer not to smoke or vape. The proverbial red-headed stepchildren of the world of medical cannabis consumption are topicals. Available as creams, oils, lotions, sprays, balms, or ointments, topicals are applied to the skin and absorb through the epidermis (the outer layer). This relatively unknown avenue of consumption allows patients to treat conditions of the skin, joints, and muscles using topicals infused with whole plant cannabis or an individual cannabinoid, such as THC or CBD. While most cannabis users are unaware of topicals, even fewer know that examples featuring THC produce no psychoactive effect in patients. Thus, seniors, children, pilots, and anyone who either cannot or does not desire to experience a psychotropic “high” can use THC-infused topicals with confidence. It is estimated that up to three percent of Americans have psoriasis, which results in more than 10 million sufferers in the United States alone. Globally, roughly 125 million people are afflicted with the condition. Unfortunately, there is no known cure for this highly uncomfortable and often stigmatized disease, of which eight major categories exist, depending on the body areas affected and nature of the rash-like patches of plaque. Because psoriasis is caused by problems with the immune system, cannabis is an especially effective treatment. The cannabinoids in cannabis fit perfectly into special receptors in the endocannabinoid system of the human body. These receptors, called CB1 and CB2, are concentrated in the brain/central nervous system and the immune system, respectively. However, the latest science reveals that each receptor type is found throughout almost all organs and tissues of the body, just with different expressions (densities and patterns). 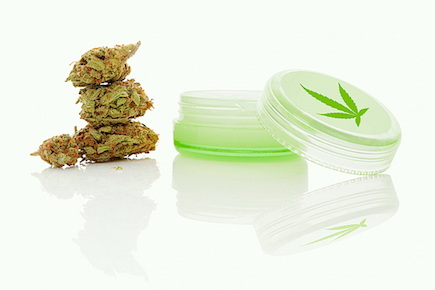 Conventional pharmaceutical drugs used to treat psoriasis, typically systemic immunomodulating agents, involve many problems that are not associated with the use of cannabis or cannabis topicals. These include fever, diarrhea, liver dysfunction, and increased chance of infection. Thus, cannabis effectively deals with the significant cause of this skin condition, inflammation, and its chief symptoms, pain and discomfort — all while avoiding the negative side effects of pharmaceutical drugs.